Alamo, Nev. – That buzz out there is the growing infatuation for drones and drone racing, and it will be on display in Alamo on May 18 and 19. First person view (FPV) drone competition is growing in popularity all over the country. These events feature drone operators with first-person goggles connected to a camera mounted on their drones. They race by remote control through a track full of various obstacles. Spectators say the drones look like “a swarm of angry bees” as they maneuver through the courses. 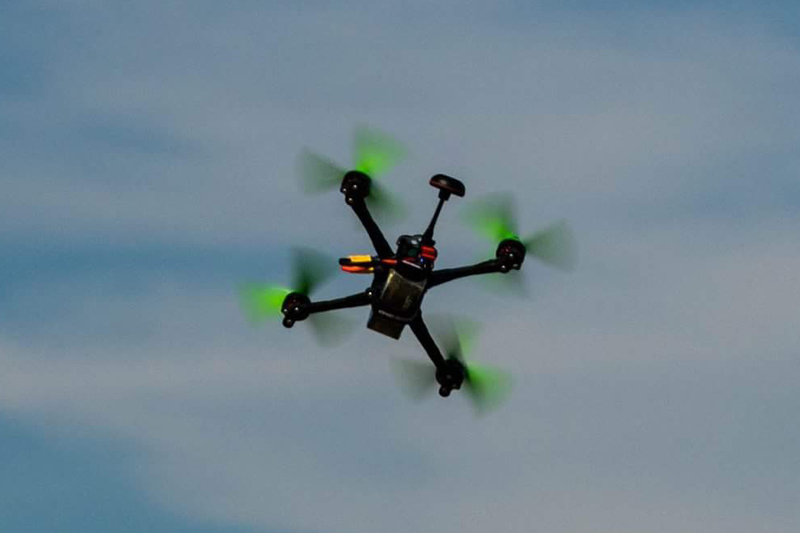 The Lincoln County Authority of Tourism (LCAT) is partnering with the Las Vegas Drone & FPV club to create the inaugural Lincoln County Drone Expo and Alamo Shootout Races. Racers are invited to enter the Shootout, which includes micro and main events with various prizes up for grabs, including $2,500 in cash. There will also be time allotted for open flying of drones of all varieties. Individuals, with or without drone experience, are invited to come watch the races and try their hand at flying a drone themselves in the indoor Drone Zone. Experts will be on hand to show them how, and once participants have the hang of it, they can test their new skills on the micro track. Food, vendor, and information booths also will be set up next to the flying area. Promotion by the tourism-focused group bills the event as an outing an entire family can enjoy, providing unique new experiences. It also highlights other activities available in Alamo, including the Pahranagat National Wildlife refuge and outdoor recreation. “We’re excited for both local and visiting families to come together and have a great time,” Hurd said. The event will be at Pahranagat Valley High School. The micro drone cage and track, as well as booths, will be in the multipurpose room. Outdoor racing and flying will be outside on the football field. Doors open both days, Friday and Saturday, at 9 a.m. with check in and open practice beginning at 10 a.m. for the racers. Races start at 2 p.m. each day. Micro drone flying and booths will run all day until about 6 p.m.
Those interested in attending the event can learn more and register online at http://lincolncountynevada.com/lincoln-county-drone-expo/. Inquiries on sponsorship, booth reservation, or any other questions can be directed to Ben Rowley by calling (775) 962-2461 or emailing info@lincolncountynevada.com. The drone expo is supported by the Nevada Commission on Tourism (NCOT) and the Lincoln County room tax fund. The Lincoln County Authority of Tourism (LCAT) endeavors to increase visitation to Lincoln County, Nevada. The organization is led by a group of volunteers and is recognized by the Lincoln County Board of Commissioners and Caliente City Council as the tourism authority for Lincoln County. The Las Vegas Drone & FPV Club offers fun events and helps bring the message that drones are good to the Las Vegas Community. The club meets weekly for practice and monthly for racing and photography meetups.